It's time to do better. Hello Ward 2! Welcome to the first “snow emergency” of the season. Remember, it’s a “park even” year… There’s a lot to cover here today, and my sidewalk won’t shovel itself, so let’s get started! Property Taxes in Ward 2 are skyrocketing this year as property values climb thanks to the overwhelming number of home sales to condo developers in the past two years. The way Assessments work is an increase based on your property type indexed to average sale prices in the prior few years. What that means for you is that if your property has been assessed with a major price increase this year, we can fight that by requesting the City Assessor to come out and visit your home to give a proper assessment. If you haven’t done any recent home improvement, there’s no reason for you to be seeing a 20%+ increase in your home value for tax assessment. I implore you to please file an abatement application – the City Assessor has committed to come out personally to every request in Ward 2 and revalue the properties appropriately. The application can be downloaded HERE and must be emailed to the Assessor by Jan 31, so please fill it out and let your neighbors know as well. One last point: if you’re a senior on fixed income, you may also qualify for a raft of other abatement options. Please check those out at THIS link. I’m proud to announce that the Community Land Trust Working Group that Alderman Ewen-Campen and I have been working on since mid 2018 has finalized its recommendations on how to proceed in establishing a truly independent and democratic Community Land Trust here in Somerville. This was a major campaign platform item that I probably spoke with you about at your door, and I’m thrilled that we’re moving closer to its creation. The full report can be read here, if you’re interested in 12 pages of the details – but be assured that more announcements on this important affordability tool will be coming soon! And if you’d like to get involved, please send email to SomervilleCLT@gmail.com to join the mailing list and lend a hand in creating this exciting new organization. Coming soon on Jan 31 is the Public Hearing on our new proposed Condo Conversion Ordinance. This is an important step that will strengthen tenant protections in our outdated ordinance to match those I helped the residents of Millbrook Apartments negotiate back in early 2018. The hearing will be at City Hall at 6pm on Jan 31, and I invite you all to come out and hear about the ordinance, and give us your opinions. Details on the ordinance can be found on the city’s website at this link. One final crucially important affordability improvement for homeowners is the extension of our Residential Exemption program to your sewer and water bills. Resident homeowners can now apply for a 35% reduction in their Sewer & Water bills, thanks to a Home Rule Petition put forward by Alderman White and backed by the entire Board. This is a big win for folks on fixed incomes! There have been 15 break-ins reported in Ward 2 in the past 6 weeks, in what constitutes a crime spree for our quiet neighborhood. Available here is a lot of information put together by the crime analysts at Somerville PD. I met with the chief and lead analyst on this Friday – following yet another break, this one reported Jan 17 on Harold St – and they are taking a lot of measures to work on this. There is one suspect whose photo has been distributed by the city (white male, heavyset, age 50s, white hair); there may be a second suspect active as well. To this point the break-ins have been mostly during the day and seem to be well-cased to take place when no one is at home. 1) Keep your eyes out for your neighbors. I know it’s hard in a world of AirBNB and dog-walkers to know who “belongs in the neighborhood”, but if you see a white man with a rolling suitcase, call SPD’s non-emergency line (617-625-1600) and report it so that they can follow up with you if a break-in is reported in the area. The general M.O. of the break-ins is entry through a front door or window, exit with a rolling suitcase from inside stuffed with valuables. 2) Register all of your electronic devices that have tracking mechanisms (like Apple devices) and record the serial numbers. If someone takes one of these, SPD can work with Apple via subpeona – or your own “where’s my iPhone” style tracking – to locate your device and possibly the suspects. 3) If possible, vary your daily routine. The suspects may be casing targets for some time before breaking in. My house was broken into and burglarized back in 2015, and I understand how devastating this can be. I know the SPD is working hard on this, and hope that we’ll have some resolution. Regardless, please do get renters or homeowners insurance and do what you can to keep your neighborhood safe. Just as a reminder: there’s no more accessible Alderman in the city than yours truly. Every Friday morning I hang out my shingle at 269 Washington Street, and welcome all comers between 8-10am. Please come down and chat about what’s on your mind! It’s usually a lively group, and the conversations are wide-ranging. For a decade, Somerville has used “Reserve Lists” to abuse and manipulate the civil service hiring process. I can say that with confidence, since the City has lost multiple cases before the Civil Service Commission indicating that nepotism and favoritism warped the supposedly fair process that Civil Service hiring for police and firefighters is supposed to guarantee. Back in 2015 the CBS I-Team did an in-depth story on the problem that you can watch here. Local activist DJ Cronin has also written a great piece published recently in the Patch that summarizes a lot of the problems with this practice, which the City is looking to once again extend to police hiring. While the mayor claims that these reserve lists are just ways to streamline the hiring process, reams of Civil Service decisions against this same administration say differently – and I am not convinced. I have been meeting with both the police chief and the Personnel Department and conducting my own investigation into these practices, and will be subjecting this move to scrutiny in my Confirmation of Appointments committee. The time for “business as usual” has passed, and I will not stand for abuses like those of the last decade to occur on my watch. Another sore point for local activists is the Somerville Wage Theft Ordinance. Passed in 2015 to great fanfare, it has literally never been enforced. In late 2018 the Herb Chambers group – which has a location in Ward 2 – was found liable for a 6-figure wage theft settlement with its workers. Unfortunately, the mayor’s administration has taken the position that Somerville’s much-vaunted wage theft ordinance can not be enforced against them. Interestingly, Herb Chambers executives donated over $7,000 to Mayor Curtatone’s campaign fund on 11/21/18 – and have donated over $51,000 to his campaign over the years. I am working with a team of local activists rewriting our ordinance to leave no room for ambiguity and to compel this administration to enforce the ordinance against unscrupulous employers who abuse their employees – and extend it to also ensure that subcontractors on major projects such as Assembly Row and Union Square are held accountable as well. I’ll be pursuing this work in the Licenses and Permits Committee with Alderman Rossetti at the Chair, so stay tuned. One final piece on Accountability: recently our Home Rule Petition was approved which expands the current 5-member Somerville Redevelopment Authority to 7 members, one of whom will be an Alderman appointed by the President of the Board. This step should bring some more visibility and attention to their process, and will help ensure that the people of Somerville have a voice in the room where it happens. Since the SRA will be vital in the future on further development plans for Boynton Yards and Union Square East – as well as the proposed new Public Safety building just over the Ward 1 line in Cobble Hill – this change is critically important and I hope Alderman Ballantyne will appoint one of the stalwart hawks of the Board to SRA, like Alderman McLaughlin or Alderman Ewen-Campen. I am pleased to announce that the nominations to the Urban Forestry Committee have finally been chosen by the administration and will be submitted to the BOA for approval on Jan 24. I will be expediting their processing and plan to take them up before the end of January in my Committee on Confirmation of Appointments. While we still don’t have the complete list of the selections, I am excited to see the full list and put this enormous pool of concerned and hard-working citizens on the task of ensuring that our city starts living up to the moment when it comes to tree preservation and planting in Somerville. Relatedly, a petition was recently put online by Chris Dwan, a ward 2 resident and outspoken activist who was one of the people tapped for the UFC, calling for the Arbor Day Foundation to revoke Somerville’s “Tree City” award status. Given what we’ve seen over the past 2 years, I’m hard pressed to disagree. Hopefully, the input of an empowered Urban Forestry Committee will lead us to stop the bleeding and reverse the damage done. It hasn’t been yet announced, but coming soon is a new ordinance that, similar to Cambridge, Arlington, and Newton, will protect large trees on private land. This has long been a priority for Alderman Niedergang – and one which I’ve written about skeptically in this newsletter before. After all, if the city can’t control it’s own tree removal problem, why target private home owners? I’ve been working with a team on resolving the concerns I had, ensuring that homeowners always have a reasonable path to removing trees if needed while also doing a strong job of incentivizing developers to retain existing giants that make a neighborhood feel like more than a flash in the pan. That legislation is ready, and I’m sure we’ll see a full announcement later this week. At the same time, I have been beyond frustrated with the tree removal we’ve seen in Somerville over the past year. As we’ve seen, our current ordinances require little restraint on our governments worst impulses, and I have been working on a major revision to Somerville’s treatment of trees on public property. I hope to have that legislation in Committee by the end of Q1. If you are passionate about Somerville’s trees – and their important role in mitigating climate change – then I encourage you to join one of the great organizations in Somerville that are fighting for them. Green and Open Somerville and Somerville Friends of the Urban Forest have both been leading this charge, along with the Somerville Climate Coalition. In the past month alone, I hosted 8 separate neighborhood meetings regarding developments proposed for Ward 2. I think it’s vitally important for neighbors to know about what’s being proposed for their block, and ideally want their input considered before bringing those applications to the ZBA. While Ward 2 continues to be the single most active place for condo construction in the city, I’m pleased that the developers seem to be starting to take the hint – it is no longer “open season” on our ward. These meetings are causing productive changes in development plans to increase green space and trees, improve design and traffic impacts, and in some cases even pull back from projects that would significantly damage a neighborhood. If you get a notice on your door for one of these neighborhood meetings – not the ZBA mailed postcard, but an actual flyer – I really encourage you to come! It’s a good place to find common ground with your neighbors and I promise that your input makes a huge impact at this early stage of the process. It’s a great way to get involved and it really makes a difference. Voting will be February 2 (Saturday 12-4pm) and February 4 (Monday 7am-8pm) at the Police Station for a new year and the new Board of the Union Square Neighborhood Council. It’s wonderful that we’ve had this hard-working bunch negotiating with the Master Developer in Union Square for big changes in the plan. On that list are accelerated affordable housing, increased green space, moving all the parking underground, green building standards for energy efficiency, ensuring that living wages are paid during the construction, and guaranteeing management neutrality when it comes to union organizing in the businesses that will inhabit the new buildings. Check out the USNC’s website for more information about the candidates – who are some of your most active and civic-minded neighbors – and if you’re concerned about the future of Union Square I encourage you to start attending these meetings! Next year, it might be you on the ballot for the elected Board! Thanks for reading and staying engaged! I hope to see you some Friday at my weekly office hours, or you can always reach out to me at (857) 615-1532 or via email. Now, where’d I leave my shovel? Folks, the property tax levy for 2019 is being brought before the Board of Aldermen tomorrow, and I just got a sneak preview. It doesn’t look like good news for ward 2 residents. There is a Public Hearing on the matter scheduled for TOMORROW, 11/29/2018, at 5:30 PM, at City Hall. For renters, this may drive up rents as landlords increase rents to protect their profit margins. For homeowners, the city already has a high residential (owner occupancy) exemption at 35% – meaning that the exemption is placed at 35% of the “AVERAGE ASSESSED VALUE” of homes across all of Somerville. Unfortunately, that means that houses that see big increases in valuation see corresponding decreases in benefit from the exemption. That is exactly what is happening here in Ward 2. Ward 2 is projected to be among the hardest hit in the city by property valuation increases. Across the board, triple deckers in Ward 2 are going to see an increase greater than 20% in property value according to my understanding of the Assessor’s proposal. The impact on taxes for owner-occupants, including the elderly, will be even higher than 20% though. If the average assessed value is 800k and the exemption is about 300k, the remainder of 500k is taxed. When the value goes up to 1M, 700k is taxed; a 25% increase in value results in a 40% increase in effective taxes. This is what longtime Ward 2 residents are facing. It’s a potential catastrophe, and I fear that it will drive condo conversion and further displacement in Ward 2. I appreciate the Assessor taking the time to preview the data prior to the meeting tomorrow, but I was left uncertain on how I can proceed from here. I can tell you that the presentation will be at a public meeting, and that there will be a public hearing afterwards where all members of the public are invited to come and comment. Remember, that’s TOMORROW, 11/29/2018, at 5:30 PM, at City Hall. After that hearing, I’ll be asking a lot of questions before committing to a vote. Now: what can we do about these increases? As I understand it, I can’t force the Assessor to go out and raise valuations in Ten Hills to balance the burden. I also understand that we are already at the maximum amount that we can tax commercial property according to state law (a “1.75 factor” that will be referenced tomorrow night). What I can do is tell you that if your home is hit by a large valuation increase this year without having been visited in person by the tax assessor, WE CAN FIGHT THAT. Please contact me. The Chief Assessor has committed to come adjust the value of your home if you challenge the assessed value – if there have been no major home improvements since the last assessor visit, there’s no reason for it to take the outrageous 20%+ increase in valuation that the city is bringing forward this year. It’s very possible that we can get your property valuation (and taxes) adjusted back down. Please let your elderly neighbors know about this as well – they may not be getting my email newsletter. There are also some programs for tax deferment for elderly and low-income people, and we can explore getting people into those programs too. I’ll try anything to keep you and your neighbors from being displaced from your home by rising taxes. These increases are coming automatically by my understanding, but we can fight them one at a time. And if that’s the only avenue we have, we’ll take it. Wherever the fight is, I stand ready to help you. Thank you for taking the time to read this. I don’t have all the answers yet, but I’m committed to transparency and I wanted you to know as soon as I heard about it. This kind of information isn’t something I want you finding out about in the newspaper or in your tax bill. I’ll provide more updates as soon as I have them. Hi Ward 2! There’s a lot to cover here at the end of the year and this is a long update. Let’s get right into it! SomervilleCityTV’s YouTube channel is an amazing source of video of all kinds of events around the city. It’s stunning what all you can find there! If you missed an event, it’s not a bad bet to check out the channel and see if they have video. The first annual Veterans Day Parade is up there along with several related ceremonies , as are the remarks at the flag raising for the Transgender Day of Remembrance at Somerville High School. I was glad to be at all of those, and hope you feel well represented. There is a major, six-month detour planned for Somerville Ave. near Union Square, as part of the sewer overhaul and street reconstruction. Due to Eversource’s delays in getting their utility work done, this has now been delayed until mid-December. I’ve been pushing the city to delay it past the holidays, so that the shops that rely on a good holiday season to stay in business won’t be disrupted. Recreational Marijuana is in the news again as the first two shops have opened up in western mass. Both of those are existing medical shops who transitioned into recreational sales – an outcome that we anticipate here, but which I personally felt wasn’t the best we can do. The Cannabis Control Commission agreed in their guidelines for creating equity in the industry and rectifying some of the harm done by the War on Drugs. I’m proud to say that my efforts brought regulations into effect here in Somerville that are groundbreaking in terms of their equity impact, according to the early reviews. Our work is already being used as model legislation in Boston and other cities, and I’m hopeful that the rest of the state follows Somerville’s lead. If you’d like to know more about how this law helps encourage local business and other affected communities, get in touch with me. The last step for Somerville is finalizing the zoning which determines where new shops can open. I am recused from that conversation due to state Conflict of Interest Law because my house is directly abutting an area under discussion for that zoning (just as Alderman Davis is, as well). I can’t help push this piece of it along, but I hope my colleagues can bring themselves to an efficient and equitable conclusion on this piece quickly. Also in the Land Use Committee is an ordinance that would require developers of tall buildings to provide more open space in their plans – or pay into an Open Space Acquisition Fund that Somerville can use to create new parks. If we had these rules in place 5 years ago, Union Square would have more open space planned by law than resulted from the mayor’s negotiations with his hand-picked developer. Once again, it’s an example of why we should legislate for what we want, instead of legislating against what we don’t want. Negotiating with massive developers is a losing hand for city governments desperate for revenue – and the neighborhood residents are the ones who end up paying the price. I am eager to get these rules in place, and I am pushing to do it soon. It’s time that profitable high-rise construction actually contributes to green space here in Somerville and benefits the residents, instead of just enriching developers. In addition, there’s a great piece of legislation we’re considering that mandates new buildings near highways and busy roads have enhanced air quality management systems. The health cost of living near highways is well understood and striking: new buildings near highways are terrible for residents’ health, especially children. We need to hold developers to a higher standard that puts health over pure profit – and these new rules will do exactly that. Again, I hope we can get these rules implemented now and then rolled into the full zoning overhaul once it is finalized. Speaking of which, the new year will be the launch of amendment season on the citywide Zoning Overhaul. That’s a big conversation, and I welcome your input. Ward 2 has some great minds, and together I know we can craft something that gets us moving forward without sacrificing our neighborhood – and our neighbors. The work begins again in 2019 on this. One piece of legislation that just got some attention in the press was actually from the Open Space, Environment, and Energy Committee. Put forth by Aldermen Mbah and Ballantyne, it would ban all plastic straws in Somerville. I already had some initial thoughts about how this would impact health care and child care facilities, and I’ve heard a lot of concern about this from the disabled community as well. I will work with my colleagues next year to make sure that any ordinance that gets passed is one that enables conservation rather than burdening disabled folx. There’s also a lot of items sitting in the Legislative Matters Committee. The current items prioritized by Chairman Niedergang are an expansion of the Historical Preservation Committee’s ability to block new construction projects by up to two years (on almost every lot in Somerville), and a set of regulations to restrict short-term-rental units in houses here. On the “demo delay” ordinance, I think the first draft chokes off homeowners from pursuing renovations while doing little to actually stop bigger developers from razing our city. We need to do better than the proposed legislation, and I’ve been making the case strongly that there are other ways to accomplish our goals. It’s improved already, and I have confidence that we can produce significantly improved legislation before implementing it. On the short-term-rental ordinance, AirBNB (and VRBO, and others) is a significant factor in taking housing units off the market and creating dangerous unlicensed hotels, and we don’t have good tools to manage it currently. There’s a lot of nuance in this particular issue: I see a lot of good that comes from AirBNB in my neighborhood, like having a place for relatives to stay for a few weeks nearby when a family has a newborn child. But we need carefully crafted legislation that prevents abuse, protects tenants, cuts off incentive for shady operators, and still allows the kind of homey experience and flexible income that short-term-rentals can provide. I’ll be putting a lot of work into this coming into 2019, and I welcome your thoughts. Send me an email! Three meetings in particular are coming up of specific interest to Ward 2. First, there will be an update on Conway Park’s shutdown (and mysterious re-opening) that I hope will provide more transparency. I’ve pursued every angle, including Freedom of Information Act requests, to try to pry information out of the city – and this meeting will hopefully give us all answers that we’ve been waiting far too long to hear. That meeting will happen Wednesday December 5 at 6:30pm, in the Public Safety Building (Police Headquarters). If you can’t make it, there will be video available on the SomervilleCityTV YouTube channel listed above, and on the city’s web page dedicated to Conway Park updates. Second, there’s a meeting to discuss the design options for an upcoming renovation of the Allen Street Playground happening Tuesday, December 18th at 6pm in the Academy Room at the Public Safety Building. If you’d like to see the plans and provide feedback, come on down! Finally, there’s been some discussion about noise coming from the skate area at the new Lincoln Park. I am working to schedule a stakeholder meeting that brings together abutters with the broader neighborhood and the folks who use the park every week – to meet with city staff and hear each other out. Aldermen Niedergang, Rossetti, and Hirsch have also agreed to come down and join the conversation. I’m hoping to have that meeting sometime in early January, and will publish more details as soon as they’re available. Thanks for reading this through! If you’re excited about the work I’ve been doing and glad for the new voice in City Hall, I’ve got one more ask for you: please join me this Saturday Dec 1 to celebrate at my re-election campaign fundraising event or make a donation online. All of the progress made this year has me hopeful, but keeping that momentum going will require that I have the resources to stay in office asking the hard questions and using every scrap of data and every parliamentary and legal tactic available to force this administration to respond to our demands. I’ve researched legal precedents, filed FOIA requests, held hearings, drafted legislation, passed resolutions, and even blocked funding requests to make sure our needs are taken seriously and addressed. Thanks to the dedicated crew of activists here in Ward 2, we’re staying ahead in this fight so far – but I need your help to push farther and do better in the next year, and hopefully in the next term. Let’s gather on December 1st to celebrate our victories this year and rededicate ourselves to the fight ahead in 2019! I hope to see you at Cantina La Mexicana on Dec 1 at 6pm, and I thank you sincerely for your support. It’s been a rough month for a lot of us, but regardless of the current climate there’s work to be done and progress to be made at the local level. Thanks for tuning in for this month’s ward 2 update! There’s a lot more to talk about and a lot more on our docket, but I’ll hold the rest for next month. In the meantime, please do send me an email with any questions you have, or swing by my office hours every Friday to ask your questions in person! Beginning in November, there will be a major traffic detour in Union Square, lasting about six months. This is part of the long-planned infrastructure work on our sewer system intended to combat the chronic flooding in Union Square. Our engineering department has the single most comprehensive traffic management plan I’ve ever seen to try to handle the disruption, but it’s still going to be a pain. The city will be holding a community meeting this coming Wednesday, October 10th, at 6:00pm at the Union Square Police Station (220 Washington St.), to present the details of the plan, answer questions, and take feedback. I’ve already been spreading the word on social media and expect heavy turnout for this, and I have confidence in Jess Fosbrook and the engineering team to answer the questions we all have. The city communication department’s Ward 2 ResiStat meeting has been scheduled for October 30th at the Argenziano Cafeteria. Pizza and snacks at 6pm, meeting starts at 6:30pm. I look forward to hearing the updates. While we’re talking about resistat, though: the only way the city can get data for making good decisions is by analyzing 311 calls and reports. I have been loving the 311 App on my phone, and use it all the time to report potholes, broken sidewalks, and rat sightings. Even though I walk everywhere and spend time on every street in Ward 2, more eyes and ears are better. Please join me in reporting all the issues you see in Ward 2! As Chair of the Board’s Committee on Confirmation of Appointments and Personnel Matters, I have worked diligently to reform the entire appointments process here in the city of Somerville since being elected. That hard work is paying off as we are seeing some long overdue changes – and accountability – on our appointed boards. This was one of the big themes I heard from voters during the campaign and during the first several months of my term, and I’m glad to be delivering on my commitment to you. At our August 28th meeting, the Board voted with me in denying the re-appointment of one member from each of the Planning Board and the Somerville Redevelopment Authority. Several others are stepping down and declining their re-appointments. The era of rubber stamps at City Hall is over; the time for accountability has come. I’m proud of this work, but it has just begun. With an active – and activist – board, we can do more. I look forward to it. I thank the departing members for their long service on these boards, and look forward to new appointments by the Mayor who bring fresh perspective to these boards and who reflect the priorities of the Somerville of today. I’m not done pushing yet. In addition to the great work done by the BOA in approving $150,000 for new tree plantings this year and creating a new position for a senior Urban Forestry coordinator, I am glad to say that the process of creating a new park in Ward 2 (on Washington St) is moving forward! The appraisal for the property is expected to be complete soon, and I look forward to beginning neighborhood design meetings as soon as possible. With determination, working together, we can move forward towards a greener Somerville and actually begin to make substantive progress towards our Somervision goal of 125 acres of new open space. But in order to do that, the administration needs to have the political will to proceed – and we’ll need to hold firm to these promises to do better. As part of that, I’ll be supporting legislation that prevents us from replacing any green and open spaces we have now with more buildings. I look forward to it, and am glad to be delivering in a small way on this important commitment for the residents of Ward 2. The ultimate exercise in political accountability comes at the ballot box, and elections are coming on November 6. The deadline for voter registration has passed, but please do join me in voting next month! A lot of important ballot initiatives are at stake, as well as the Governor’s race and the return of our senator to the federal legislature. Every Friday morning you can find me on my front porch at 269 Washington Street from 8am-10am. Please come down and visit, chat with me about anything that’s on your mind in Ward 2 or Somerville in general. It’s a good time! As the weather gets colder I may move inside, but my door is open to you. The endless march towards high-rise construction in Union Square continues. Despite the incredible work of talented Somerville residents and activists to propose substantive changes, there’s no sign that feedback is being incorporated – and there is still no word on a substantive Community Benefits Agreement. Regardless, the developer is pushing the process forward: the latest plans are going to be presented on Wednesday, October 17th, 6:00-8:00pm, at the Argenziano School Cafeteria. This meeting will be very different from previous sessions, as required by both myself and Ward 3 Alderman Ben Ewen-Campen. There will be a presentation at the start, followed by a time for Q&A that will give residents a chance to hear what questions their neighbors are asking and get a sense of what kind of changes are possible. I’ve gotten a commitment from the developer (US2) that they will post their plan information online for review by the public at least one week before the meeting, and I hope they will honor that commitment. I am sure that with advance exposure to the designs, the brilliant and invested residents of Ward 2 will come prepared to offer substantive and critical feedback for this plan – a plan that will shape Union Square for decades to come. Though I have to personally recuse myself from the deliberation and vote on this item (given how close my property is to the development), the Board will be considering once again whether to transfer one final parcel the developers need for their high-rise complex on October 22. This is the last leverage point that the BOA has to ensure that a CBA is signed and that the development meets the design standards for Union Square, so it’s important that my colleagues hear whether or not you support moving the development forward at this point. Please be sure to review the plans and send email to the Board with your thoughts about what you see and what you want. I am hopeful that my colleagues will require that the needs of the residents be met before approving this major land transfer. Mentioned earlier, this is a proposal for the long-empty lot on Somerville Ave near the Wings and UPS store. In stark contrast to prior ideas, this proposal is for a hotel that will bring around $500k in affordable housing contributions over $100k for Somerville’s new job training program. In addition, it’s been a really landmark example of what can be done when working closely with the neighborhood and the developers to ensure that the neighborhood’s priorities are respected. After the first set of plans were submitted, lots of us dug in to provide feedback and the developer came back with a substantially improved plan that pulled the building back off the sidewalks, planted over twice as many trees, and is providing a much improved environment for pedestrians. In addition, they worked with us to change the driveway arrangements to mitigate the traffic impacts on an already congested part of town. Even more exciting: the development includes high energy-efficiency standards and looks like it may become the first major construction in Somerville that includes ALL NATIVE PLANTINGS in its landscape design. All in all, it seems like a major win for affordability and our ecology, and I am hopeful that we’ll see movement on that site soon. There’s still a long way to go – including public hearings at the ZBA and more meetings to be held – but I’m excited by this new way of working to ensure development serves the community and instead of just prioritizing the profit margins of developers. We’ve been discussing several proposed ordinances around increasing the amount of open space and open space funding that high rise development (over 6 stories, commercial or residential) provide as part of their projects. It’s my hope that amendment is passed quickly, before we finish the full zoning overhaul. But speaking of that, I’m glad to announce that the Zoning Overhaul that we spent so much time on at the start of 2018 is back with a new revision for consideration. The map should be in much better shape now that I’ve spent a great deal of time working closely with the planning department over the break, and we’ll be taking it up as a full Board later this month. What I’m learning through the many meetings I’ve had all over the ward on development projects is that height doesn’t bother neighbors as much as the oppressive effects of having a building with insufficient setbacks on the sides and front. I’m not alone in embracing more height and density – and being willing to reduce parking requirements – in exchange for more room on the ground for humans, grass, and trees. Remaining concerns in the zoning for me include maximizing green space around new buildings and ensuring that our neighborhoods can still be home to small businesses that enrich our daily lives without sacrificing the feel of old buildings that stand a bit off the sidewalk. The hotel at 515 Somerville is an example of how we can do better in design that considers our ambient environment, and I want to ensure that our zoning is written with an eye to getting more of that kind of thoughtful development. I am going to be pushing hard and hope my colleagues will join me in approving this new ordinance before the end of the year! Hello Ward 2! I have been enjoying the summer tour of all 11 block parties thrown in the ward so far, and hope we can get a few more in before the weather turns on us. It has been a good summer, but I’ve also been inundated with calls about the massive increase in rats, the astounding traffic congestion surrounding Union Square, the continued tree clear-cutting that is making 2017-2018 the most dramatic period of tree loss in a generation, and the stall-out of the Beacon Street Renovation. Every Labor Day is an opportunity to remember the 30 workers who died in the Pullman Strike of 1894 – the origin of Labor Day. (That strike began because wages were cut, but rents remained too high and outpaced the workers’ earnings.) I hope you’ve all enjoyed the holiday weekend and are ready for the start of school; I know my family is excited! With the first session of the year completed and the summer hiatus of the Board of Aldermen complete, we’re back to work at City Hall. Our first meeting back (on Thursday Aug 23) was a big one, and in it I put forward several initiatives and highlighted some major problems that the city must address. In this newsletter, I’m going to hit the highlights in Accountability and Transparency. The next newsletter will come back to Affordability, where there’s also lots of exciting activity that will ramp up towards the end of the year. In addition to the big picture items, there’s plenty to stay on top of with local issues including neighborhood developments and construction projects. Thanks for staying engaged! Taken together, all of it adds up to a vision I have for what Somerville can be – a progressive and active city that prioritizes people and green space over developers and profits. Somerville can be a city that takes seriously its responsibility to provide services and rejects the neoliberal notion that private companies will deliver the benefits that our citizens need. 2018: Year of the Rat? And finally, ELECTIONS TUESDAY SEPT 4. As we enter Fall of 2018 we are faced with the ghoulish prospect of having lost nearly 15% of the trees that stand on publicly-owned land in just the past 2 years. Despite City Hall’s pride in having hired an arborist two years ago and being declared a “Tree City”, those claims ring hollow as we see our trees clear-cut all over the city with insufficient plans to replace them. This summer brought a horrific clear-cut of trees along the GLX right-of-way – far in excess of the plans presented to the public. In addition, the full scope of the High School Reconstruction became clear, as another large grove of trees was cleared to make way for an artificial turf field. Despite my Board Orders as far back as April to provide transparency as to how many trees are being removed and how many are planned to be replaced, that data has still not been provided. Through all of this, the Mayor has declined to appoint civilian oversight in the form of the Urban Forestry Commission that the Board of Aldermen created by law in October of 2017. We are now 9 months from that time, and the 15-member commission is unstaffed and unappointed. There are many private citizens clamoring for change and ready to help the city get their hands around the problem, but their voices go unheard and messages go unanswered. One final note: there is some discussion about bringing forward an ordinance to prevent private homeowners from removing trees on their property – and I think that is misguided. It is the height of arrogance to oversee the wholesale removal of trees on public lands and then point to homeowners and claim that they are the problem. I am opposed to putting more legal burden on citizens when our public agencies cannot even follow the laws related to tree removal – and will remain opposed until I see some real accountability and change in how the city handles its own public trees. Let’s clean up our act at City Hall. If you are also care deeply about this issue, I encourage you to get in touch with Somerville Friends of the Urban Forest – a group that is doing some great data-driven work and advocacy around our rapidly vanishing tree canopy, and what we can do to save and restore it. (Email them at somfuf@gmail.com) Their recent article in the Somerville Times (https://www.thesomervilletimes.com/archives/85808) details the issue clearly, and spells out concrete policy actions our administration can take right now to address the problem. I’ve been swamped with calls about rat problems in Ward 2 this summer, and I agree; this may be the year of the rat. The construction in our sewers, streets, and in many properties are disturbing the rat population and pushing them to find new homes – and our city is not responding to the problem as effectively as I’d like to see. I spent time over the summer working with ISD on their ticketing and enforcement program for problem landlords, and have personally gotten involved to help get neglected properties to clean up overgrowth and rat havens in response to neighbor complaints. In addition, I am pushing to make our homeowner-assistance program more aggressive. It’s a disgrace when our annual assistance budget for baiting private properties is underspent by about half during a time when residents are being overwhelmed with rats. I’ll continue to work with Ward 1 Alderman Matt McLaughlin’s Rodent Issues Committee to follow up on taking a more proactive stance to this problem and making sure that we feel comfortable in our streets and backyards. One major issue I heard constantly during the campaign was dissatisfaction from residents with the actions taken by the Mayor’s appointed Boards and Commissions. These members were frequently serving on long-expired terms and with questionable qualifications – and the actions they took with regard to permissive stances on big developers was deeply disturbing to constituents. This was particularly stark in Union Square and with the FRIT/Assembly Square affordable housing waiver, though the list of examples is long. I’m happy to say that Accountability is coming to these Boards. Just last week, the Aldermen’s Committee on Confirmation of Appointments recommended rejection of the re-appointment of several members of the Planning Board and Somerville Redevelopment Authority, and several other members have resigned rather than stand for re-appointment. I am hopeful that the Mayor will move with all due haste to find more qualified candidates and bring them forward for appointment, so that we can get the kind of thoughtful and qualified scrutiny these major projects deserve. I am standing and delivering on my promise to bring Accountability to City Hall. Thank you for your help! I stand with the Somerville Women’s Commission and all of #MeToo in demanding that we do better to address this pervasive issue. If you want to help, please join the Women’s Commission at one of their upcoming meetings; they’re always looking for more talented and driven women to help push the conversation forward. (Meetings happen the Third Tuesday of each month at 7:00 pm, and are posted here at this link. While the Communications Department (including Jackie Rossetti) have stepped up their focus on Beacon Street and are maintaining an up-to-date site for progress reports at https://www.somervillema.gov/beaconstreet, the news still isn’t good. This is Somerville’s own “Big Dig”. The expectation was set that 2018 would finally see the closure of this project, but with months of the construction season lost many residents are seeing the writing on the wall: this project may remain unfinished for another year. When it comes to life safety measures like lighting and signage, this just isn’t acceptable. At major intersections along Beacon Street, especially on the sourthern end, signage and markings have been neglected for years “just waiting for the work to be completed” – and people are at risk. Likewise, the lack of signage and incomplete state of construction on the north end of Beacon is actively causing vehicular accidents. Members of the Somerville Bikes Committee have sent the Mayor’s Office a very concise letter summarizing the unsafe conditions that must be remedied before the construction season ends, and I was more than willing to present that letter in our last Board of Aldermen meeting. I hope that we’ll see some response soon. In the meantime, there will be yet another meeting of the Public Utilities and Public Works Committee on Tuesday, Sep 11 at 7pm at the Argenziano School cafeteria. Thanks to Chairman Bill White for scheduling this meeting and helping us continue to pursue answers when it comes to this ill-fated project. While I voted against a “moratorium” on recreational marijuana sales given the overwhelming support Somerville voters gave that ballot initiative, there is good news – the zoning is ready, and the regulatory framework is currently being proposed. The Zoning proposal for recreational marijuana will have a public hearing this Thursday, September 6, at 6pm at City Hall in the Aldermanic Chambers. Bird was definitely the word for a few weeks in early August, as a tech company dumped electric scooters on our streets unannounced. The City has since gotten them to pull back, and is working on establishing a regulated relationship that ensures the company works closely with city departments to deliver safe and quality service on our sidewalks and streets – public property that we all share. I am excited about the possibilities that these scooters have to bridge a transportation divide and provide services to neighborhoods that lack bus and T connections. In many ways, they could be part of a larger solution for transit-deprived areas. But at the same time, I feel that it is incumbent on us to continue to invest in and improve transit infrastructure at the state and municipal level – scooters aren’t going to fix every problem. When a new “disruptive” business comes to town, it’s important to be sure that the disruption is one that is furthering our common goals. For me, I want to make sure that the businesses we partner with are paying their employees a living wage and using responsible manufacturing practices. More locally, I have the concern here in Ward 2 that our sidewalks are quite narrow – and our neighbors who need walkers or wheelchairs already have enough challenges with the condition of those sidewalks without scooters in their way as well. I also want to be confident that the companies are actually working with the city to deliver on the promises they make: in this case, to keep the sidewalks clear, pick up the scooters daily, and make payments to give back to the residents of the city where they’re operating. While Bird has promised that here (https://www.bird.co/sos-pledge-mar272018) my understanding is that they made no such approach to Somerville before dropping scooters on our streets – and there is no mechanism in place to gather those funds or monitor compliance with their other promises. As a small business owner who started up here in Somerville – with a goal of changing the world for the better – I know that navigating city regulations can be challenging, particularly with an unusual new business. I still think it’s important to talk with our neighbors and make decisions together that work for all of us. It’s my hope that a scooter company (be it Bird or some of their competitors) will approach the city and work with us to ensure that we can deliver creative (and disruptive) options that work for all of Somerville. There’s still no word on when Birds will flock back to our streets but I’ll let you know as soon as I hear about a deal being reached, and I appreciate the emails I received from constituents about the whole affair. Every Friday morning you can find me on my front porch at 269 Washington Street from 8am-10am. Please come down and visit, chat with me about anything that’s on your mind in Ward 2 or Somerville in general. It’s a good time! While we’ve heard about the goals in Somervision, the goal that gets no attention and no progress is Open Space. As we look at land being snatched up for development at ever-higher prices, and see our major projects sacrifice open plazas for denser condo development, I feel it is vital that we stand up and demand a different set of priorities from local government. It’s easy to say we need new parks, but who wants to make one? I say we need to do better, and I’m here with part of the answer. That’s why I put forward an order to build a park at 217 Somerville Ave, on the site of the former American Legion Post. Abandoned for quite some time, it is now a home only to rats and vermin, overgrown and untended by the new owner. Many thanks to Miss Rose Caterino who was the first to mention to me how the old Post across the street from her should be a park – a place for kids to play, and for citizens to pause for a moment in a green space during the day. She’s exactly correct; this should be a park. While a developer bought the land for $1.2M just a month ago (hoping I’m sure for 5 stories of luxury condos) I think we can do better. We can and should purchase that land and finally bring a park to the east side of Union Square. No more waiting for “master developers” to meet our civic needs! It’s time for us to actually move forward on creating green spaces here in Somerville. Please join me in calling on our mayor to take the necessary steps to ratify my Board Order and move forward with the creation of this park! Thanks for reading, and please do reach out anytime! As we get into Budget season and down to the end of the school year, there’s plenty of activity in Ward 2 before the summer legislative break. As the city’s legislative branch, the Board of Aldermen has the authority to confirm (or deny) appointments made by the mayor to many city positions including most department heads, many boards and commissions, and all public safety employees. This year we have undertaken an effort to improve this process and actually undertake a thorough independent review of these candidates. Unfortunately, the administration does not feel that the Board has the authority to review any documents related to job performance or sexual harassment incidents (in the event of promotion or re-appointment), or any of the application or background materials for new hires. In the case of certain Special Police officers, the administration insists that we are not even allowed to view a resume before approving these armed public safety officers for duty with full police powers. Without access to information about the appointments presented, this Board of Aldermen can be nothing more than a “rubber stamp”. We were elected to Do Better than that. As a result, I put forward a measure in last week’s Board meeting pursuant to Chapter 2, Art 4, Div 4, Sec 2-121 of the City Ordinances, that the Board of Aldermen authorizes and requires the employment of other counsel to issue legal opinion and assist in resolving the questions of the Confirmation of Appointments and Personnel Matters Committee around sequencing of appointments and confirmation, and on release of requested information from the Administration for consideration by the Committee. We are in new territory here – and the Mayor has long denied all other requests for separate legal counsel to the Board. I will let you know how the matter progresses, but it is my hope that the Board will shortly have a lawyer who can help resolve this disagreement, provide the Board with the relevant information, and move all of these confirmation processes forward swiftly. We are in the middle of the annual Budget review, where the Board is required to move line-by-line through the proposed spending by the mayor for each department in the city. The FY 2019 general fund budget is $241.7 million, a 3.9% overall increase from the 2018. Much of that increase comes in the school budget, which would increase by 5.99%. Unfortunately, by state law, the BOA is prohibited from adding anything to the budget: all we can do is cut what the Mayor has decided to fund. With that said, it’s an important exercise in transparency and I’m learning a lot about how the city manages its money, and I encourage you to follow along online. The proposed FY 2019 Budget is posted here https://www.somervillema.gov/fy19budget and meetings are being recorded and broadcast live nightly almost every night in June. I’m pleased to announce that the Community Land Trust Task Force has already met twice in June, and is pushing forward aggressively to investigate the many options in how to found, administer, and fund a sustainable and independent Land Trust here in Somerville. I’m very excited to be working with this diverse and dedicated team of 14 community members to push forward this powerful vehicle for increasing affordability in Somerville. Our goal is to provide a comprehensive report and recommendations before the end of 2018 so that we can get a Community Land Trust established and working in 2019. As I wrote about in my last newsletter, I had grave reservations about the plan proposed for Clarendon Hill. In short, it was a sale of 2 acres of state-owned land to a private developer and use a perversion of the 40B provisions to avoid their 20% affordability requirement in their cloistered luxury buildings. It would also allow them to tear down 216 units of public housing and displace the current residents for 7 years while they build around 250 luxury apartments before the Housing Authority could begin replacing the public housing. In addition, many of the replacement public housing units would cease to be state-funded, and would instead have federal money attached, which would invite Donald Trump’s ICE agents into our public housing projects here in Somerville. All of that would happen without requiring living wage employment standards during construction and granting an exemption from the anti-corruption public procurement processes required for every project on public land. It was a hard pill for my colleagues to swallow, and for me it was too much. While I am dedicated to having Somerville step up and create more public housing, this is just a giant windfall for a private developer who has already announced – before construction – that they plan to flip this luxury building as soon as possible and walk away from Somerville with a massive profit. Given the timelines presented, I fear none of the current residents of Clarendon Hill will ever actually return to Somerville. After working hard to get the city and the developer to compromise on a better deal – and seeing no movement whatsoever on the developer’s position – I made one final offer: deed restrict an additional 25 units indexed to income, even at 140k of income per year. I asked the developer to simply promise that they would not increase the rents above the level that even someone making $140,000 per year could afford. The developer refused to do even this, saying that this would directly affect their expected profits. If that doesn’t tell you volumes about this developer, and how bad this deal is for the residents of Somerville, I’m not sure what would. In the end, I voted NO to moving forward because of all the reasons above – hoping that my colleagues would agree, and that we’d either get a concession from the developer or find a more equitable way to get this public housing built. Only 2 of my colleagues joined me, and so the proposal now moves to the State House for approval, where I expect it will meet strong opposition from our state legislative delegation (although it enjoys the support of Governor Baker, of course). I hope it results in housing for the current residents of Clarendon Hills. I hope it turns out better than I suspect. I’ve been wrong before, and I expect to be wrong again – and I hope this is one of those times – but based on everything I saw this was absolutely the right vote to take and I stand by it. The Union Square Neighborhood Council is hosting a neighborhood meeting today, 6/18, at 6:30 pm at the Argenziano School cafeteria, in order to update the community on the Council’s progress in training for and negotiating a Community Benefits Agreement (CBA) with the Union Square developer, US2. The meeting is open to all, and I’m looking forward to hearing about how things are going! In my last newsletter I mentioned an upcoming meeting about 515 Somerville Ave. That meeting happened, but based on feedback there the developer has cancelled another meeting originally scheduled for tonight to “go back to the drawing board” on their proposal. I will let you know when I hear that a new plan is ready for consideration. I hope this parcel will see some movement on a positive use soon! Another major parcel is under agreement in Ward 2 – this time the J.J. Sullivan building and parking complex that stretches between Somerville Ave and Lake Street. It’s about 21,000 sqft. They are just starting to look at the potential build out of the site and beginning to talk to the planning department about it. I’d like to make sure that they are talking to the neighbors as well to make sure that you are part of the conversation as the concept for the building comes together. At a first approximation it may include a lot of commercial space on the ground level and 60 units (12 affordable) above them, potentially arranged in “courtyard” or “piazza” fashion with retail on the street frontages as well as the interior – like Bow Market – with housing on top. I think it could be a very exciting opportunity to get this developer to create a pedestrian mid-block crossing from Somerville to Lake and connect two existing maker/innovation spaces – Fringe and Bow Market – and work with the city Planning and Transportation departments to get mid-block crosswalks and a raised crossing installed on Lake St that could significantly slow through traffic. A meeting may happen on July 11th or July 12th – and I’ll be sure to keep you all updated on that and any other upcoming meetings in Ward 2! I hope you all had a peaceful and reflective Memorial Day weekend. Construction activities continue to ramp up as we enter the unofficial beginning of summer. I’m working on revamping my email lists to create different segments for folks who like traffic and construction updates, folks who want legislative updates, folks who just want to know about upcoming meetings, etc. But for now, I wanted to put out a quick note about all the construction that will be happening this week so you can plan ahead. Pavement milling (the act of removing the top 2-inches of old pavement prior to final paving) will take place on Lowell Street between Broadway and Somerville Avenue requiring parking restrictions and road closure. Please note that detours for this work and work on Cedar Street will happen simultaneously, so higher than normal volumes on Willow, Central and Porter Streets can be expected next week. Pavement milling will take place on Bolton Street between Oak and Houghton requiring parking restrictions and road closure. Pavement milling will take place on White Street between Elm Street and the Cambridge Line requiring parking restrictions and road closure. Miscellaneous sidewalk construction on Beacon Street between Roseland Street and Oxford Street requiring parking restrictions. Full depth roadway construction on Beacon Street between Dickinson and Concord requiring parking restrictions and alternating traffic. Eversource gas main replacement in Union Square including the Plaza and Sanborn Court requiring parking and traffic restrictions. Eversource gas main replacement on Oak Street between Houghton and Prospect Streets requiring parking restrictions and road closure to non-abutters. Note that Eversource work on Oak Street will not start until D&R Paving is complete with Bolton Street. Excavation of test pits on Somerville Avenue between Bow and Medford Streets requiring parking and traffic restrictions. Removal of nine trees, generally in the area of the Plaza. Relocation of water main in Medford Street between South Street and the Cambridge city line requiring water shutoffs, parking restrictions, and one-way alternating traffic. The coordination of this work with GLX and activities on Gore Street, Cambridge require extended working hours including 7 to 7 on weekdays and 9 to 7 on Saturdays. If you foresee or encounter any issues with construction activities – or if you see road-affecting utility work that isn’t on this list – please contact Jesse Moos at 617.625.6600 x5419. Also please note that they now have an email address construction@somervillema.gov that goes to select staff in both the Engineering and Communications departments. That email address is the best one for anyone with construction-related feedback or questions to use. After another eventful month, here’s another Ward 2 newsletter! I wrote at length in the previous newsletter about the process we’re undergoing to reform the Appointments and Confirmation process, and am pleased to report that we have delivered to the administration our draft “manual” – expectations as a Board of the information needed to review candidates for Appointment and Promotion. We’re still awaiting the administration’s official response, but look forward to working with them to ensure that the process is transparent and comprehensive. Somerville deserves to know that your public servants are being properly considered by your elected representatives. We do have an extensive backlog of appointments to consider, and have provided a schedule that will ensure that the most critical positions are considered quickly once the administration provides the requested materials for review. In Ward 7, the Clarendon Hill public housing project is 70 years old and failing its residents, who are currently suffering in horrible conditions. It is time for us to step up as a city and state to renovate this housing and fulfill our commitment to the residents of this housing project. Currently before the Board is a Home Rule Petition that would allow the city and state to effectively sell 2 acres of public land to a private developer and allow them to build 253 luxury apartment units on the site, using the proceeds to help fund a portion of the reconstruction of the Clarendon Hill public housing units that currently sit there. (It is technically a 99-year renewable and assignable land lease – functionally a sale.) While an argument can be made that this is a responsible way to obtain funding to renovate public housing units, the problem (as usual) is in the further details of this deal. In this deal, a perversion of the intent of our state affordable housing law (MGL 40B) is being used to justify a reduction in the number of affordable housing units built in the luxury for-profit apartment buildings in a deal reminiscent of the shameful FRIT Assembly Row “compromise”. Of the 278 privately-built units planned at Clarendon Hill, only 25 would be subsidized and affordable – a far cry from the 55 units required by our 20% Affordable Housing law. In addition, this Home Rule Petition would allow the private developer to avoid the responsibility to pay prevailing wage standards for the construction labor on their project. As a project only being made possible by the agreement to use public land for a private for-profit development, I find this to be extremely difficult to justify. We have an obligation to hew to our principles. We have failed the residents of Clarendon Hill by failing to maintain this public housing in good condition, and as the state and federal government continue to retreat from this duty we as a City are prepared to step forward. However, it is just as important that we maintain our commitment to economic justice for workers – sacrificing fair wages and labor standards should not be part of the bargain. We have been told at the Board that this private developer – and the banks that will profit from the financing of their project – have immovable constraints based on their expected profit margins. It is beyond time that we treat fair wage and labor standards with as much reverence as we treat corporate profits. It is my earnest hope that we can work together to find a path forward that restores the public housing at Clarendon Hill in a way that does not sacrifice one principle for another. If this private developer fails to do so, I fully expect to call upon our mayor to step up and provide the necessary funding to move forward with the reconstruction of this public housing project using the funds promised (and still undelivered) from his disastrous FRIT Assembly Row deal. 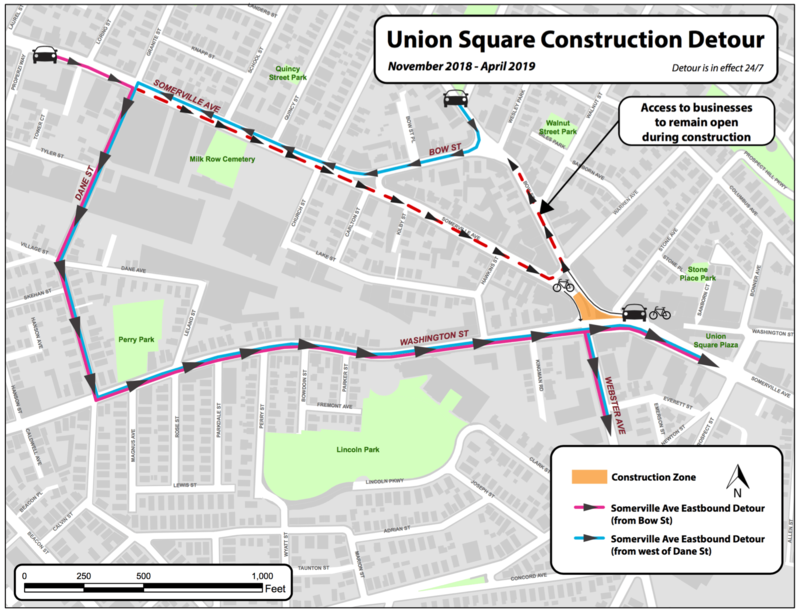 With construction season in full swing and impacting ward 2 heavily on Beacon Street and in Union Square, in addition to several other projects by Eversource on Preston St and paving on Bolton St, there’s a lot of construction to keep track of. Thankfully, longtime DPW employee Jesse Moos has been promoted recently to the newly created Construction Liaison & Compliance Manager position in the city’s engineering department. You’ll see Jesse a lot in Ward 2 with his clipboard and cheerful attitude, as he’s down here almost daily monitoring the construction and keeping businesses informed as to closures and outages that will affect them. He’s also in charge of making sure we don’t have any more “heavy-equipment-til-11pm” fiascos on Beacon Street. You can reach him with questions or complaints about road or utility work at jmoos@somervillema.gov. I’m glad to see him on the job and providing more accountability on these city projects. We have a full schedule of Public Hearings this week at City Hall. These are chances for you to come out and let the Board and administration know your thoughts on a variety of issues we are considering. As described above, a Public Hearing on the Home Rule Petition that would allow for the sale of public land to a private developer, waiver of their affordable housing requirements, and waiver of requirement for that developer to follow public procurement and prevailing wage laws will be held. Thanks to this mayor’s inability to reach an agreement with the Somerville Municipal Employee Association union, Somerville’s School Nurses have not received appropriate raises in many years. As a result, we have lost nearly half of the dedicated nurses that have served our children in Somerville schools. This untenable situation cannot continue. The mayor’s proposal to resolve it is to remove the school nurses from being general city employees and place them instead under the control of the School Department as non-union positions. This move would potentially allow the hiring of new nurses to replace the ones we have lost, at the cost of further undermining the union’s already weak bargaining position. You can read the request here (http://somervillecityma.iqm2.com/Citizens/Detail_LegiFile.aspx?Frame=&MeetingID=2618&MediaPosition=&ID=18220&CssClass=) and speak at the public hearing on Tuesday night at City Hall to let us know how you think we should vote on this issue. Somerville’s “Payment In Lieu Of Taxes” (PILOT) agreement with Tufts University is expiring. Each year Somerville loses over $6.7 Million in tax revenue that the university would otherwise pay for their property in the city. In exchange, we have in the past agreed to receive a paltry $275,000 annual payment from the University. Obviously, this is just 4 percent – a far cry from the 25 percent that the City of Boston receives from Tufts University in their similar PILOT agreement. The Board of Aldermen is hosting a public hearing so that you can tell us what you think about the PILOT agreement our mayor negotiated with Tufts this Thursday night. There has been a lot of debate in the Aldermanic Chambers about the proposed zoning overhaul. As budget season approaches, it looks like we’ll be setting it aside for the time being and returning to it in the Fall for another look. We held several public hearings about the zoning which were very well attended. The issue of eliminating triple-deckers and limiting most neighborhoods to two-family houses was a topic of much conversation, among many other issues. The presence of new “Fabrication” zoning to protect innovative startup-and-studio spaces for small business creation has also been a real emphasis in the current proposal. While public comment on the current version expires on May 25th, the planning department will be taking all those comments in, revising the plan, and proposing a new version in the fall. It is my hope that we’ll be able to put important anti-displacement protections in place prior to passing a zoning overhaul to ensure that current residents will be able to remain in our neighborhood as it grows and changes. There were over $700 million in property sales last year alone in Somerville, and this is a way for us to capture a small amount of our runaway market and use those dollars to help fun much needed programs to stabilize current residents in housing long-term and increase homeownership in our city. The next step will be for this item to be approved formally this Thursday and sent to the State House for approval there, before returning to Somerville for drafting the details of the final ordinance. Thank you for your discussion, comments, and engagement during this process! I’m very excited to announce that a task force is being assembled by the administration to explore the best structure for a Community Land Trust here in Somerville. I’ve written about and advocated for this extensively, and this is a great next step. I’ll be serving on this task force, and am glad to say that Ward 3 Alderman Ewen-Campen has been selected to co-chair this important effort. With all the work on my plate, I can use all the help I can get! I look forward to getting rolling with this Task Force soon, and coming forward with a clear direction to get started with this vital, community-controlled affordable housing initiative. I was happy to speak at Rep Mike Connolly’s campaign kickoff event last week, and tell the story there of our victory at Millbrook Apartments. The largest apartment building in Ward 2, it was completed just 2 years ago. Now the 100 rental units there have been proposed for condo conversion – the largest such in Somerville. Thanks to the efforts of the tenant organizers and Rep Connolly, we were able to fight back against this mass displacement and ensure that residents got their concerns addressed. Today I can tell you that every low-income subsidized housing tenant (20 units in total) will be able to retain their housing permanently instead of being displaced. Today, I can tell you that every market-rate tenant will be receiving moving expenses plus $10,000 cash compensation from the developer for being displaced. This is a massive victory – the kind that comes only when we all work together. Even better, it paves the way for a new Condo Conversion Ordinance in this city that will protect residents in the future and slow down the constant stream of condo conversions that plague our neighborhoods. I hope that we’ll be able to put an ordinance on the mayor’s desk for signature before the end of 2018. I was glad to attend the 2018 Somerville Heroes Salute at the Holiday Inn on Saturday honoring fallen veterans, and the American Legion Post 18 Veterans’ Ceremony this Sunday morning placing flowers and wreaths at each of the monuments lining Highland Ave. Both events were well run and the Heroes Salute was particularly well attended. My father retired a Colonel in the USMC and was a decorated combat veteran in Vietnam who is buried in Arlington, and my family has a long history of military service – I particularly understand that these ceremonies are important remembrances for the families of veterans. Unfortunately, the city cancelled the Memorial Day Parade originally scheduled for this afternoon due to inclement weather forecast. I was as surprised as many of you to receive a flyer for a neighborhood meeting this Wednesday May 23rd at 6pm in the St. Anthony’s Community Room at 12 Properzi Way to discuss a proposed development at 515 Somerville Ave. Most of you know this site as the empty lot across from Rite-Aid on Somerville Ave, formerly targeted for eminent domain as a site for a new fire station. The owner has a new proposal at the planning department which you can see here ( https://www.somervillema.gov/sites/default/files/Plan%20Set%203-9-18%20(reduced).pdf ). Unfortunately, I am chairing a committee meeting that night, and all of the other local aldermen (Hirsch and Ewen-Campen) will also be in that committee. It is my hope that another neighborhood meeting will also be scheduled so that we can attend and hear the neighbors’ feedback on the plan. In the meantime, please do feel free to send me an email to let me know what you think about the proposal. House Fire in Ward 2: Many of you are aware of the fire on Washington Street just outside of Union Square on May 2. I was at City Hall having a meeting about environmental protection and Conway Park when I got the call that my house was on fire. Over the past 3 weeks I’ve been working with insurance and the Inspectional Services Department to ensure that the structure was sound, and am glad to announce after a period of homelessness that my family is able to return to our house. Be it ever so soggy-and-somewhat-charred, there’s no place like home. Everyone knows someone who has been through a house fire, and it’s an unsettling experience. Many thanks to the community members and friends who reached out over the last few weeks and opened their homes to my family to give us a place to stay while we were displaced. Reconstruction will be a long process, but at least we can stay in our home during the repairs. I’ll be having office hours this Friday at Brickbottom, and hope to return to my regularly scheduled Office Hours each Friday from 8-10am at 269 Washington Street starting in June. It’s been another busy few weeks in Somerville! I’ve hosted many neighborhood meetings about local development, the citywide zoning overhaul, and city infrastructure construction. It’s great to see so many of you getting engaged at the neighborhood level! In addition, it’s been a busy Committee schedule at the Board of Aldermen, with big pieces of legislation getting a lot of attention and major reforms happening in the way we process public safety promotions and appointments. In addition, the Board took a very close look at an unprecedented request by the Mayor to create $2 Million in new city employee positions outside of budget season. There’s also been a lot of deliberation around a proposed Transfer Tax, and there are several other large items under consideration by the Board. Recaps of all that, plus a quick review of upcoming meetings, are in this edition of the Ward 2 Newsletter! Our public safety employees – firefighters and police officers – are some of the most critical positions the city hires. It may not be well understood outside of city government, but every police and fire hire is an appointment by the Mayor. The details of that process are pretty arcane, and while Civil Service is intended to ensure that applicants are treated fairly and ranked by qualification, the fact is that Somerville doesn’t have the greatest history when it comes to complaints with the Civil Service Commission. This link shows three cases the city has been involved in just in the past year when it comes to hiring practices around the police and fire departments. As Chairman of the Confirmation of Appointments and Personnel Matters Committee, I have undertaken with my colleagues to reform the process by which these critical hires are approved to ensure that these positions receive appropriate consideration and that the hiring process has sufficient review. Since coming into office, this committee has reviewed five police promotions, two new firefighter hires, and nine new police hires. In the course of those, we have uncovered concerning issues regarding the ways these appointments are made, and are pushing to put in place further reforms to our city’s process. When it comes to Firefighters, our use of a Reserve List (that has a several year backlog) is causing a situation in which new highly-qualified applicants who take the civil service test cannot be hired, and both the Massachusetts Superior Court and the Civil Service Commission found that our process included favoritism towards relatives of city employees and unjustly bypassed candidates for employment. Making matters worse, the Reserve List process we currently use means that no justice is available for the bypassed candidates, and they won’t be hired as firefighters. We are working to find a solution that brings more equity to this process and do better moving forward. In terms of police promotions, our review resulted in the first known case of a promotion being denied by the Board. This was a serious step undertaken with only the gravest concerns. I am proud of the process we created and the consideration that my colleagues on the Board gave to this important matter. The people of Somerville deserve to know that the hiring process is equitable and thorough. I want to extend my congratulations especially to Ward 2 resident Lysander Amado, who was recently hired as a Somerville firefighter! Lysander grew up here in Somerville and played football for Somerville High School, and his family are long-time residents of Washington Street. He has been serving in the US Army and is up for promotion to Sergeant. In addition, he speaks four languages (!) and I have confidence he’ll be a great addition to our Fire Department. Welcome, Mr Amado! In March, the administration put forward 20 new non-union positions to be created in the city government covering a great many positions. Many of my colleagues joined me in expressing concern over this unprecedented expansion of city payroll outside of the usual budgeting cycle. With a Board consisting of 5 new members who have never participated in the city budgeting process before, I felt it was important not to over-commit creation of new salaried permanent positions without a thorough explanation of how it would impact next year’s budget and the city’s complicated financial outlook. As you can see, these votes were contentious – and it’s a sign that this Board is taking the job seriously. Fortunately, even with such apparent disagreement on the Board the mood is quite congenial, and I’ve had a blast getting to work with my new colleagues. The Board had a Public Hearing that was very well attended, and I’m happy to say that the feedback was heard and that we are making important progress. At our last meeting, the Board moved unanimously to pursue a strategy introduced by Alderman Stephanie Hirsch in which all owner-occupants (both buyers and sellers) are fully exempt from paying the 1% fee – the fee would only paid by developers, investors, and absentee landlords. We’ve still got a lot of work to do with six more meetings scheduled over the next month to work on the details. In addition, another Public Hearing will be scheduled in May so that residents can provide input on a more detailed proposal that is closer to its final form. In terms of “what will this money be used for”, that’s a big part of my concern. The proposal I’ve been hammering on since the first days of my campaign has been a Community Land Trust that helps Somerville residents become Somerville homeowners – and it’s a perfect way to deploy these funds to help Villens stay here and raise families in the city we all love. I’ll keep working with my colleagues and the administration to ensure that this money goes to fight displacement and help current residents stay in this city. In addition to all of this work in the Legislative Matters Committee on the Transfer Fee (which you could also call the “Developer Tax”), we also spent a fair amount of time discussing the Tenant Right-of-First-Refusal (or Tenant Right-To-Purchase) bill. This would create an opportunity for tenants to purchase the homes in which they currently live, if their absentee landlord decides to sell the building to a developer. While the mayor’s office proposed an initial version that had a lot to object to, a small group of local residents and my colleague in Ward 3, Ben Ewen-Campen, have been working with me to write a draft that more closely matches our intent. Just like the Developer Tax/Transfer Fee, this right would not trigger for owner-occupied homes – only for absentee landlords. In addition, the right of a homeowner to keep the property in their family is preserved. At the same time, this bill provides an immensely important opportunity for existing tenants to buy their property outright (perhaps even with assistance from the Transfer Fee revenue via the Community Land Trust) or to work with another non-profit affordable housing developer to buy the home and remain in Somerville, rather than being displaced for more “luxury condos”. We’ve still got a lot of work to do on this, and I’ll be continuing to work on the proposal over the next few months. I’ve met with a lot of constituents about the idea already, including the Small Property Owners Association, and want to make sure I hear everyone’s thoughts. We’ll bring it back to the Board for consideration later this year, and I assure you that there will be plenty of meetings set aside for public comment and review before acting upon it. In the meantime, if you’ve got thoughts on the current proposal linked here, I’d be happy to hear them. I hosted a series of neighborhood meetings through February and March to get residents together and have small group conversations about neighborhood issues and citywide issues with zoning. Dan Bartman from the Planning Department was able to attend most of them to hear your thoughts first-hand, and he thought they were really valuable! While there were a ton of different viewpoints in the room, and frequently serious disagreements, the end result were some fabulous conversations and some real consensus about a few points. First, most of us are very leery of major out-of-town developers. The risk to our neighbors and our neighborhoods of displacement is real, and we’re all feeling it. Trust in city government to act in our interest to protect us is low. That’s the bad news. The good news is that we can articulate very clearly what we love about our neighborhoods, in ways that I think will shape the zoning positively. We want to preserve people more than buildings – and so affordability is a key priority for people. Our small businesses and local services are treasured parts of the community – and everyone wants to make sure Market Basket stays here forever, if possible. Finding ways to improve the zoning and allow small businesses to start up and operate along our main streets (Prospect, Beacon, Washington, Somerville) in the existing building types is important to many of us. Finding ways to enable reasonable growth without turning our neighborhood into a condo-flipper feeding frenzy is high on everyone’s mind. This theme was also evident in the public hearing, and I’m happy to say that I’ve had more meetings with the Planning Department to try to work these ideas into the next draft of Zoning. At the moment, it appears that we’ll continue to work on this as a Board for several more months as time allows, but that ultimately the Zoning proposal will expire at the 90-day window and be resubmitted as a new draft with a great many changes incorporated from our neighborhood meetings to be taken up again in the Fall. I for one am glad that we’re taking the time to get it right – and hope that we’ll be able as a city to put some strong anti-displacement measures in place to ensure that the growth in Somerville is something that all of us are still here to enjoy in five, fifteen, or fifty years. Beacon Street work is once again underway. We had a productive meeting of the committee on Public Utilities and Public Works at the Argenziano on April 2, though we still don’t have all the answers I’d like about how construction has been handled there and the removal of Beacon Street’s trees. With the construction beginning again, unfortunately we’re already seeing that Newport isn’t necessarily handling business in the way we’d hope. I’ll continue to push for tighter schedules and more accountability in this process, and am grateful for the help of some seriously engaged neighborhood activism around this! Speaking of which, there is a tree hearing concerning the six remaining trees on Beacon Street on MONDAY, APRIL 23rd. It will be held at the Public Safety Building at 220 Washington Street, starting at 6pm. Based on what I heard at the PUPW Committee meeting, this is your opportunity as a community to demand a change in the plans that preserves any of those trees – rather than removing them and replanting them. It would be a very expensive change process to undertake, and would require the city’s transportation department to request those changes, but that’s the reason why we have these hearings – to get you the information, and hear what you want done. In the meantime, I’ve also put in several board orders to address ongoing safety and visibility problems along Beacon Street (including at Durham, Park, and Eustis), and will continue to follow up on every concern you bring to me! I absolutely commend the folks up at city hall for doing a great job on communicating information about this important project both to residents and to business owners in Union Square, in cooperation with Union Square Main Streets! As you all know, these buildings are part of a large-scale redevelopment of Union Square. This series of community meetings on the D-2 block are therefore likely to be very important, and I hope many of you are able to come. I know both myself and the Ward 3 Alderman will be in attendance to see the plans and provide input – and hear yours. The City is not hosting these meetings, but I hope US2 has included time for members of the public to be heard and to hear each other at the meeting. The Somerville Spring Clean-Up is happening this Saturday, April 21st, 10am. Ward 2 meet-ups are happening at the ArtFarm location at 10 Poplar St, at the South St Farm, and at the Quincy Street Open Space., 14 Quincy St.
9am-10am: Kickoff & breakfast provided by Comcast at the Boathouse at the Blessing of the Bay park. 12pm-2pm: Community BBQ lunch provided by Mayor Joe Curtatone and the City of Somerville at the Boathouse. Includes interactive activities for kids and adults! Enjoy music by Rose and the Wild Edibles! We’ve had a lot of work done lately, and a lot more coming up. While we had good meetings about trees and the Somerville Ave streetscape work, there’s a lot of other changes that have happened in the last year (and are coming soon) that deserve their own time as topics for public review. Here’s the meeting that Brad Rawson with Traffic and Infrastructure is hosting at the request of myself and Alderman Hirsch. The forum will be held in the Academy Room at the police station, 220 Washington St. For more information, please email transportation@somervillema.gov. Now that the weather isn’t absolutely miserable, I’ve been out in the neighborhood again knocking on doors and talking to neighbors. Quite frankly, it’s the best way I can reach out to hear from you – and I don’t want the only time you see me to be in a public hearing or during a campaign. Thanks for making it through this long newsletter – even at such great length, I know there’s plenty that I haven’t covered. If you’ve got questions about anything going on in the ward or at City Hall please just come by on a Friday morning, shoot me an email, or give me a call – I’ll be happy to come chat. Hi there, just a quick heads-up that I’ll be hosting yet another neighborhood zoning meeting this weekend, this time focusing on the Duck Village and Beacon St neighborhoods north of Washington Street. I look forward to seeing more of you there – and I’ll be out in the neighborhoods putting flyers on the doors today and tomorrow to let everyone know!